Today’s fashionistas can access the catwalks of New York, Paris, London, and Milan Fashion Week with the click of a button or tap of an app–and they can mark their purchases just as easily. 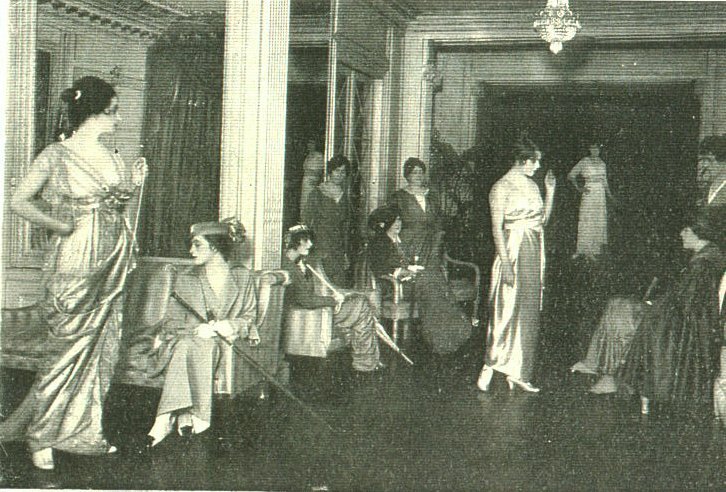 Though Edwardian women didn’t have YouTube or apps, they too had fashion shows, and just as today’s fashion industry is divided into two seasons, so it was in the 1900s. Paris has always been the center of the fashion industry, and couturiers used the fashionable races at Auteuil and Longchamps in the spring and in the autumn to unveil their latest designs. Mannequins (models), carefully attired in whatever daring trend the designers hoped to press upon ladies, would casually stroll about the racecourse, stopping at suitable intervals for perusal. Sometimes the wild designs backfired, as was the case with the mannequins dressed in trousers around 1913! This was followed on a more restrained scale by English designers (Redfern, famous for the tailor made, made its mark at Cowes). Lucile is credited with the creation of the “mannequin parade,” and this became a staple in not only dressmakers’ establishments, but upscale department stores. Sipping tea in the fashion department, while a parade of girls strolled by in the latest designs became de rigueur for middle- and upper-class women, and they needed only point at what they wished to buy. The cult of the model was decades away, but Lucile once again paved the way when she hired statuesque young women and gave them romantic names like Gamela and Hebe, and took them with her on fashion tours of the US. The mannequins play one of the most important rôles in these Palaces of Modes. They are the live “dummies” on whom are displayed the costumes. All day long they must promenade the salons of the establishments where they are employed, revolving slowly before the eyes of a critical battery of customers, that the effect of the gown may be better judged on a living figure than it may on a thing of wires and papier-maché. Frequently there is a stage upon which the mannequins play their parts, parts which call for quite as much endurance as the most tragic roles of the real stage. Endurance, tact and skill in their highest forms are all called for, and upon the ability of the mannequin to impress the buyer with the graces of a particular gown depends the sale quite as much, in many instances, as upon the skill of the designer or the insinuations of the salesman or woman. The physical and mental strain is unceasing. From nine in the morning often until nine at night the mannequin must be on her feet, changing from one costume to another at the caprice of the most erratic of clients. Her position and advancement depend upon her ability to clinch sales. All her natural and artificial charms are brought to bear. The mannequins are selected for their svelt figures and for their beauty of face as well as of form. They wear a tight-fitting, black sheath garment, over which the gowns are shown. A mannequin in a swell establishment is paid something like thirty dollars a month, perhaps a little more if her reputation as a seller is particularly good. Another service which she renders is posing in public places in the new creations of her employer that a new fashion may be well launched in the eyes of the public. She may be seen at Longchamps on the day of the Grand Prix, at Armenonville, at the Pré Catelan, indeed wherever fashion congregates. On the occasion of the Grand Prix she is generally out in full force, parading in the paddock as in the tribunes, or strolling in the enclosure reserved for high society. She will perhaps be dressed in the most bizarre of creations and be followed greedily by all eyes, but she glides along, seemingly unconscious of the throng or the part she is playing, though she divides the honours with the horses and the jockeys. All feminine Paris studies the mannequins on parade at Longchamps greedily and on the verdict does a new style catch on or fail. Betting on the success of a new style is as exciting as the “Pari-Mutuel” at the Grand Prix. « Getting into Public School, or Scary Entrance Examinations from the 1880s!